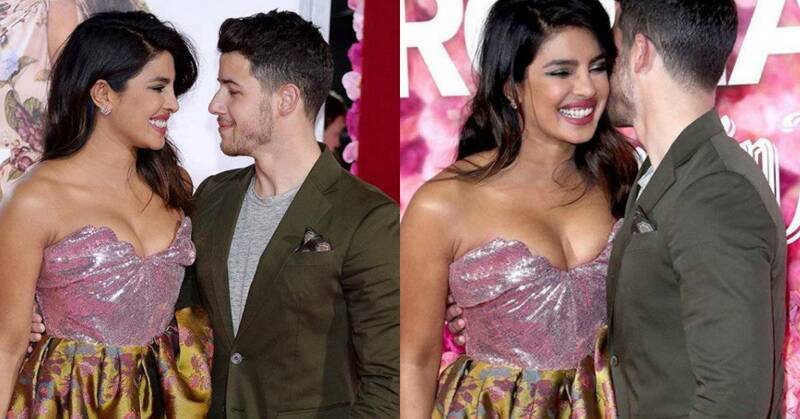 Priyanka Chopra And Nick Jonas' Lovestruck PDA At The Premiere Of Isn't It Romantic Is All The Mushy Romance We Want To See This Valentine's Day! Well, love is truly in the air this Valentine's Day week. This clearly holds true for the power couple Priyanka Chopra and Nick Jonas. Priyanka who is gearing up for her upcoming Hollywood film Isn't It Romantic attended the world premiere of the film recently along with her husband Nick Jonas. The two were quite the couple goals at the 'pink' carpet which indeed made us say, isn't it romantic? For the occasion, Priyanka looked stunning in a strapless hot pink Vivienne Westwood gown while Nick looked handsome in a grey tee with a brown blazer and pants. Priyanka Chopra took to her instagram to share many lovestruck and mushy pictures with her hubby at the occasion, the two were all immersed in love while posing for the shutterbugs.In one video, the couple can also be seen sharing a lovely kiss. The film is directed by Todd Strauss-Schulson and also stars Rebel Wilson, Liam Hemsworth, Adam DeVine and Betty Gilpin in the lead roles. PeeCee plays Isabella, a yoga ambasaddor in the film. The film will be releasing tomorrow on February 13th, 2019.